Contribute regularly to a local food bank; give practical assistance at a soup kitchen or other welfare-service outreach; companion the lonely or aged shut-in; nourish the hunger in another for a listening ear, conversation, a walk or some recreation. On these pages are stories of some of the many faith-based nourishing support services and activities in our communities for physical, spiritual, emotional and mental wellbeing. Matariki has two meanings that both refer to the cluster of stars. Mata Riki means ‘Tiny Eyes’, and Mata Ariki means ‘Eyes of God’. Matariki is the Māori name for the small cluster of stars also known as the Pleiades. When the Matariki star cluster rises in our New Zealand skies, it signals a month-long celebration across the country of the Māori New Year. In New Zealand the star cluster comes into view low on the north-eastern horizon, appearing in the tail of the Milky Way in the last days of May or in early June, just before dawn. This heralds the Māori New Year. It is a time when the whole whānau ‒ family ‒ gets together to celebrate and give thanks. This year, the Matariki began in early June and runs until early July. It is a time to pause for reflection, to honour our deceased loved ones, to learn from the past, and to plan for the future as we celebrate the rising of the star cluster. In this Year of Mercy, this Matariki we are called to be a people of te atawhai ‒ mercy. Let us honour that call by bringing love, compassion and a new way of life to those around us, particularly those in need. From: Parish of Our Lady of Kāpiti ‒Te Whaea Tapu o Kāpiti. More than 100 years later, while the service has changed a little the intent is the same – if a person needs a hot meal, he or she is served and no questions are asked. 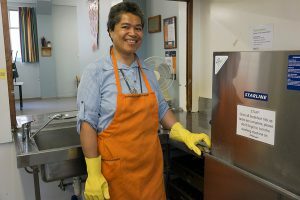 At the Soup Kitchen on Tory Street, manager Karen Holland leads a team of staff including Sophie, Francesca Eru, Matt, Sr Sosefina, Paul, Lelina, Wai, and chaplain Fr Devlin, supported by a raft of volunteers. ‘Our Mission is to support people in need to live with dignity in the community’ says Karen. ‘Here we provide support for people ‒ many with complex issues – around such things as mental health, addiction, homelessness and poverty. We provide services in a way that is respectful and honours the dignity of the individual. ‘We do this by providing two nutritionally-dense meals a day, breakfast and dinner, six days a week. And by promoting access to other services and participating in the wider community and engaging in meaningful and productive activities. All our guests are treated with the utmost dignity and with attention to detail in every aspect of our hospitality. Not all the guests are homeless – many are single people who can’t cook and who come for the company. 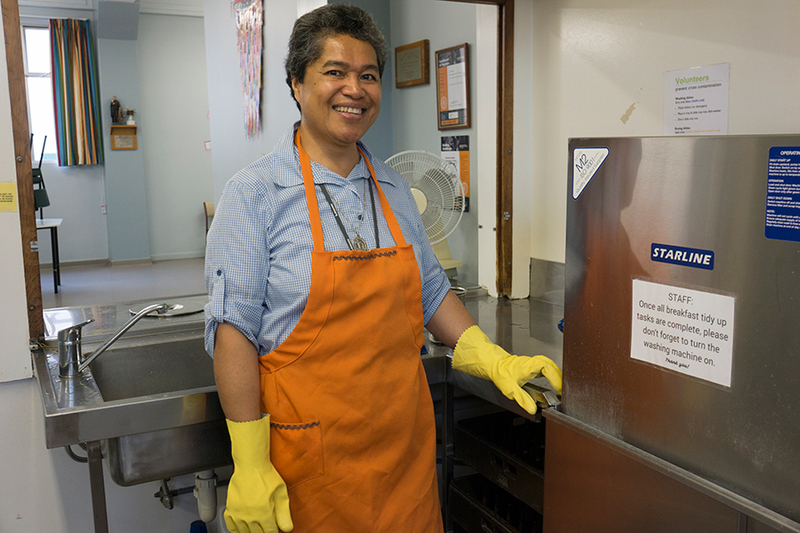 The Soup Kitchen’s Annual street appeal in Wellington is Friday 1 July. The Soup Kitchen ‘touches all with the Compassion of God’. The dignity of the individual is utmost – Karen and Josephina prepare for guests. 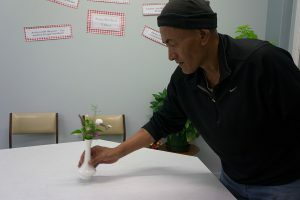 Volunteer Fabian setting tables for guests. Pastoral care worker Sr Sosefina prepares for guests. DCM has been active in Wellington city since 1969, firstly as Inner City Ministry, later as Downtown Community Ministry and more recently as DCM. This is strongly supported by parishes of the central city. 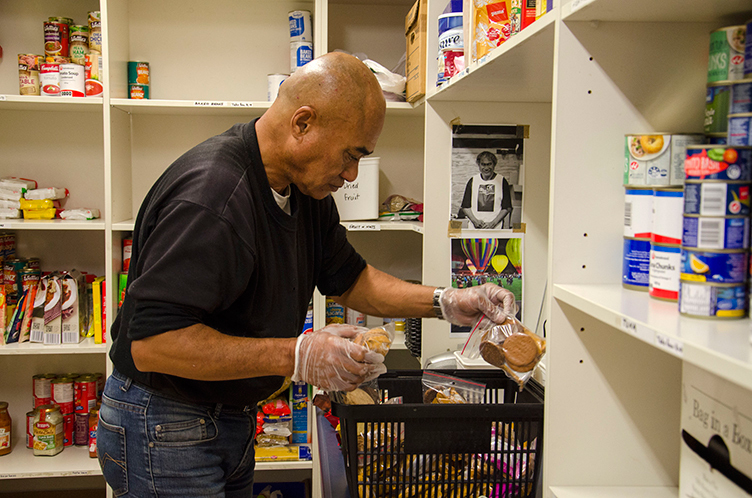 Our vision is of a community where housed and healthy people can to live meaningful, independent lives connected to their families and to others. We are not there just to pick up the pieces, but we help people put their lives back together. Every year we work with some 850 people, most of whom are homeless or at risk of homelessness. 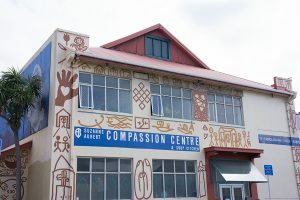 We support them to find housing, manage their money, access health services, and connect with whānau and their cultural roots, and provide opportunities for recovery-focused programmes. We have led New Zealand responses to homelessness and have strong collaborative relationships. Together in 2015 we established Te Korowai Nui o Te Whānau ‒ ‘the big cloak that wraps around the family’. 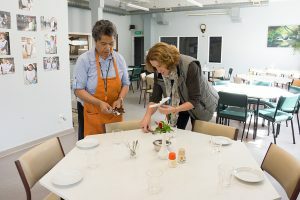 It is a vibrant, integrated hub within the central city where the disadvantaged and marginalised people of Wellington can gather and know they are welcome as they access the services they need. Te Korowai includes Te Hāpai – ‘to lift up, elevate or advance’. 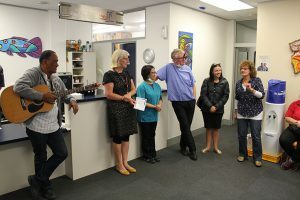 It is a safe space for people to talk with skilled staff, take part in culturally-based and other activities, and connect to other Te Korowai services. Te Hāpai has up to 40 people visiting the service each day. Te Korowai also includes two Te Aro Health Centre rooms ‒ a primary health clinic that reaches out to homeless people, and the DCM dental service that is staffed by volunteer dentists and other partnerships from the city. DCM Wellington annual book fair is on Saturday 27 August from 8am–8pm at Shed 6, Queens Wharf. DCM Director Stephanie McKintyre (far right) and dentist David Corcoran (3rd from right) launch DCM’s very first dental session. Te Amo in our foodbank, preparing items for the afternoon session. Over 40 years ago, Ian and Shirley Duthie had a calling to work in Central Hawke’s Bay. They bought a home and made their base in Otane. From there the Pleroma Trust, as it was first known ‒ now called Pleroma Social Services ‒ was established and has been operating since July 1978. Pleroma started out as a provider of Christian supplies and Pleroma Social Services began soon after that. With a vision for ‘inspired people, thriving families, healthy communities, Pleroma puts Christian values of service, stewardship and integrity into practice by working in and alongside the Central Hawkes Bay community, from Te Aute in the North to Takapuna the South. The word Pleroma, from the Greek New Testament, means ‘fullness of Christ and to make whole’, says Pleroma Social Services Manager Rachel Mackey. ‘We feed the hungry in many ways. Our four core areas of wholeness for our clients are: to be safe (from all abuse); connected (to people around them); resourced (physical connections); and whole (feeding the hungry). ‘We’re proud of the services we offer and we have a number of full-time social workers and counsellors. Our work ranges from delivering food parcels, supporting or advocating for clients through WINZ and working with parents around skills such as anger-management for children. We are also doing some work around cold homes to help people by way of insulation subsidies. ‘There is a strong need in our region for our services and people are on waiting lists as we don’t have enough money to have the number of counsellors we need. With economic pressures there tends to be a high rate of family violence, and there is a fair amount of depression and mental health issues with farmers due to droughts and uncertainties. Children are dealing with an awful lot in life too. The more we can get kids through the door for help, the more we can prepare them for life. Funding in part comes from a government contract (MSD) and the rest through grants and donations. Rachel says, ‘Many people and organisations generously give their time, resources or donations, but we’re in need of ongoing funding and donations. We have a funding drive focused on hope, called “Hope Starts”. If we can get people to support us financially, for say $20 or $30 a month, we can budget for more counsellors so we can increase our response to community needs for wholeness. 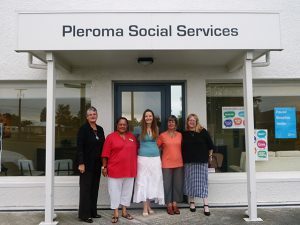 If you would like to support Pleroma Social Services’ work, see their Hope Starts web page at www.hopestarts.nz/contact email admin@hopestarts.nz phone (06) 856-8124 or call in to 38 Higginson Street, Otane. 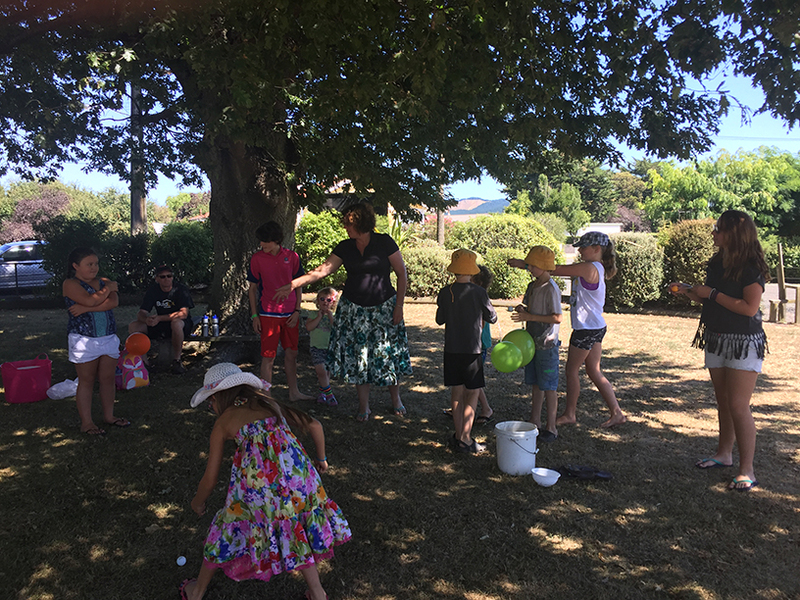 Children and families having fun at Pleroma’s Children’s Day Picnic put on for the local community. The Young Vinnies Breakfast Club! Breakfast by Vinnies: St John’s College Young Vinnies group with their Hastings Co-ordinator Mrs Paola Minehan, love what they do and do what they love. 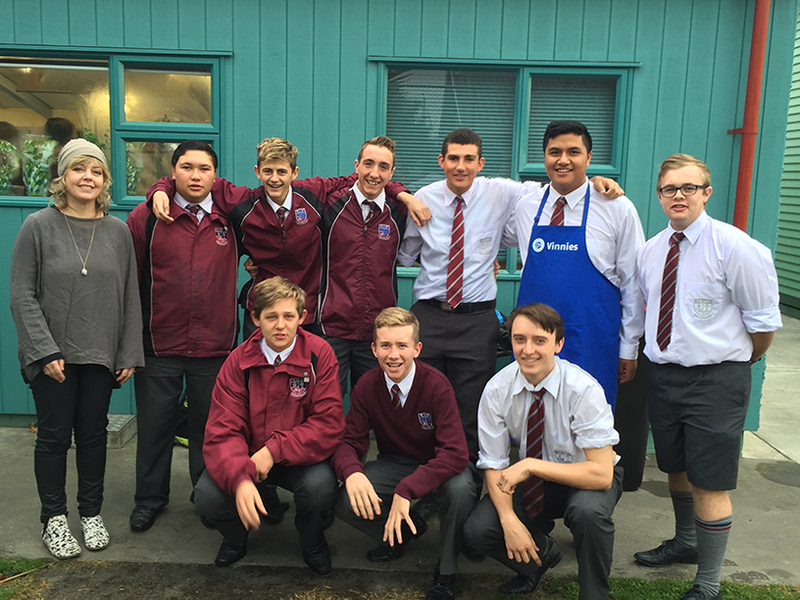 Every Tuesday, a team of boys from St John’s Catholic College Hastings sacrifice their early morning sleep to follow the motto of the Year of Mercy – Feed the Hungry. From buttering the bread, to frothing up milk to preparing Weet-Bix, these boys are prepared to feed those in need. With the help of Mrs Paola Minehan, Hastings Young Vinnies Co-ordinator (and whose son used to go to St John’s College) the students feed up to 100 students with toasties, hot chocolates and Weet-Bix smoothies. The Young Vinnies group aimed to feed as many hungry students they could, with the support of the Society of St Vincent De Paul. A government programme called Kickstart Breakfast was introduced to supply free Weet-Bix and milk to feed hungry students in the school and has amalgamated with the breakfast club. The boys involved in the programme are proud of what they do. It’s not easy coming into school at 7am to set up for a breakfast that they themselves don’t get to enjoy. Sacrifice is the key to this project and the team are always prepared to provide for others first. With this year being the Year of Mercy, St John’s College has tried to push the idea of student leadership and this breakfast club resembles the school values of sacrifice, humility and service. Year 9‒12 students (ages 13‒16 years) organise and run the whole event themselves. From setting rosters to setting up and packing down, it is all run by the students. The breakfast is open to the whole school. We are thankful for the support of Mrs Minehan, the College and the rest of the Young Vinnies. It’s a great pleasure putting others first and to live in the values of Jesus Christ our role model. We love what we do and we do what we love – Opere Et Veritate – in word and in deed. Yr 12 student Daniel Kelly is President of the Young Vinnies group for St Johns College, Hastings. The parish social justice group in Palmerston North was set up in 1993. Since then it has engaged in a number of activities especially in relation to educating the parish on social-justice issues. Members write for the Cathedral News, elaborating church teaching on such matters as climate change, social inequality, the TTPA and employment law. We have also used Sunday liturgies to draw attention to social-justice issues; in particular Parihaka, Social Justice Sunday, and Waitangi Day. The group has produced a leaflet on Coping with Financial Stress and we have been involved in work on ‘Funeral Choice’ to help people to take control of funerals, save money and feel more emotionally involved. In 1994, after reflection on the Feast of the Body and Blood of Christ, our group set up the Cathedral Café. This provides a monthly free meal for people in the wider community who, for one reason or another, feel the need of it. A bbq is held in the summer months and during the rest of the year three-course meals ‒ with wine ‒ are provided for up to 70 people. We once had 100! Eucharist, sharing and social justice are intimately linked. 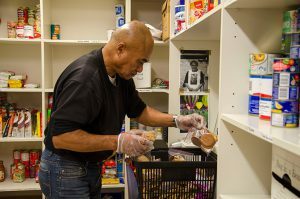 The social-justice group members provide soup and vegetables, prepare meals and serve guests. Some 90 parishioners provide the mains and desserts on a roster basis. Our group is most grateful to these parishioners for their support over many years. The parish itself funds incidentals such as electricity, juice, wine, potatoes, chippies – and meat for bbqs held over summer. Local businesses such as Breadworks also support us with food. At the Christmas café we give guests a gift provided by benefactors such as Melody’s New World and Whittakers Chocolates. Our group is aware the café does not solve the problem of poverty in New Zealand or the scandalous degree of hunger in the world. The solution, as all recent popes insist, lies with ‘the structures of power’ and with ‘a change in lifestyles, and models of production and consumption’. As Francis puts it, the Church itself must be poor as well as working for the poor. This makes radical demands on us and on the Church. And we need to lobby the government on behalf of the poor. The cafe is merely a symbol of the parish’s commitment to a decent society and a just world. In this way the café provides a local service and is one strand in our group’s work to educate the parish about the social justice teaching of the Church and the needs of the poor in New Zealand. Ivan Snook is Emeritus Professor Massey University and a long-standing member of the Cathedral Social Justice Group, Palmerston North.